Now on the shelves in the UK, the Fujifilm FinePix F31fd represents a fairly minor update to last year's F30 zoom, sporting the same impressive low light performance, courtesy of Fujifilm's 6th-generation Super CCD and RP Processor II. As with the F30, the 6.3 megapixel F31fd comes with a 3.0x optical zoom, super-high ISO 3200 sensitivity at full resolution, long-life battery (up to 580 shots), VGA movie recording up to 30 frames per second and Aperture & Shutter priority shooting plus a shedload of scene modes. Sporting a redesigned, curvier body than its 2005 predecessors - the Fujifilm F10 and F11 snappers - the F31fd also adds a hardware-based Face Detection technology and infrared connectivity for sharing photos. First seen in the company's FinePix S6500fd's bridge camera, Fujifilm's Face Detection system is claimed to be able to identify faces, optimise settings and fire off a photo within just 0.05 seconds. Capable of handling up to ten grinning faces in a frame, the technology should put an end to out of focus pictures, even when documenting a heavy night of quaffing in the old Bull and Bush. To be honest, we weren't exactly convinced of the benefits of the technology and would suggest that anyone used to focusing and reframing shots might as well buy the cheaper F30. As with previous models, the Fujifilm is something of a plain, bulky fella unlikely to find favour with camera aesthetes, but behind those ordinary looks lurks some impressive picture taking capabilities. Along with the astonishing battery life - rated at around 580 shots per charge - the F31fd comes with a crisp and sharp 230,000 pixels, 2.5-inch screen LCD screen but, sadly, no optical viewfinder. The 3x zoom lens covers a respectable 36-108mm (35mm equiv), with the aperture starting quite brightly at F2.8, closing down to a not-so-hot F5.0 at the telephoto end. We would have preferred a bit more at the wide angle end, but at least Fujifilm have junked the annoying 'terminal adaptor' seen on the F10 and F11 cameras and fitted a proper DC port for the (supplied) mains adaptor. Unfortunately, the company has stuck with the XD card format, something that may put off potential buyers who have already acquired a collection of the more common SD card. We certainly hate the things, and are happy to note that Fujifilm are slowly beginning to see the light with the announcement of their dual XD/SD slot f40fd camera. On the top of the camera is a rather fiddly mode dial offering Movie, A/S (aperture and shutter priority), Rec-Manual, Rec-Auto, Scene and 'Picture Stabilization' (which simply ramps the ISO rating up rather than providing any proper optical stabilisation). We're not sure who Fuji think they're fooling with this rather obvious bit of marketing guff, but we're not impressed. Also on the top plate is the shutter release button and power on/off control. 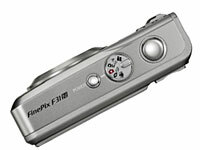 As with previous models, the F31fd is very quick to start up, with the camera ready to shoot in under 2 seconds. Next to the LCD screen on the back is a 4-way controller for navigating menus, surrounded by four additional buttons with a zoom in/out rocker switch above. Sitting in the bottom right hand corner is the button to activate the Face Detection system, which also doubles up as a useful exposure +/- control when in manual mode. Once again, the Fujifilm excelled in low light and high ISO output, producing usable images when most of its rivals would be churning out grainy snowstorms of digital noise, making this an ideal camera for nights out. We were able to get smooth results up to 400ISO, with even ISO 800 images remaining usable, although the built in AF illuminator didn't stop us suffering quite a few out-of-focus grabbed shots in low light. Daytime shots featuring lots of contrast could sometimes throw up the occasional over-exposed picture, but with a bit of care the F31fd was capable of excellent results. The lack of real manual controls was a bit frustrating and we continue to find Fujifilm's interface a little less intuitive than some of its rivals, but point'n'shooters should have no problem getting to grips with the camera. However, all these minor niggles don't stop us highly recommending the F31fd, with the camera offering class-leading low light performance, fast start up times, good flash performance and a sturdy build that should last for years.